A moderate bolted face with good rests leads to two sections of 5.10 liebacking. The crux protects with tiny cams and seems easier for shorter people. The second pitch follows an ever-widening lieback. 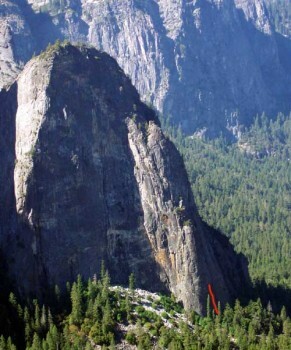 Descend each pitch with one 60m rope. Which SuperTopo guidebooks include a topo for 76 Degrees in the Shade?